This is the European Space Agency's spectacular new view of ocean tides as they sweep around the Earth. The movie shows not the bulging movement of water directly, but rather its magnetic signature. As the Moon pulls the salty seas through our planet's global magnetic field, electric currents are generated. And these currents then induce their own magnetic signals, which have now been mapped in exquisite detail by a trio of Esa satellites known as Swarm. It is a remarkable achievement because the effect is actually very small. "It's a really tiny magnetic field. It's about 2-2.5 nanotesla at satellite altitude, which is about 20,000 times weaker than the Earth's global magnetic field," Nils Olsen, from the Technical University of Denmark, told BBC News. The professor was speaking at the European Geosciences Union General Assembly (EGU) in Vienna, Austria, where a clutch of new Swarm results have been released. The mission was sent into orbit in 2013 to bring fresh insight on Earth's magnetic behaviour. Most of the global field is produced by convection of molten iron in the planet's outer core. But there are secondary components that contribute to the overall signal - such as that coming from the oceans. Other satellites will sense the tides as a change in sea-surface height. What is different about the Swarm trio's magnetic view is that it reveals the movement of the entire water column, right down to the seabed. This is important for climate studies. The oceans store and transport vast amounts of heat energy, and getting the more integrated perspective from Swarm enables scientists to build better models of the Earth system. There were hopes before Swarm launched that it might even be possible to tease out the magnetism related to specific currents as well, such as the famous Gulf Stream that shifts warm waters across the North Atlantic. The desire is still there, but Prof Olsen is a little pessimistic. It is the well-known periodicity of the Moon's orbit around the Earth that helps betray the tidal signature. The Gulf Stream, on the other hand, is a steady flow, and this consistency helps to keep its individual magnetism hidden amongst the much stronger components of the global field. 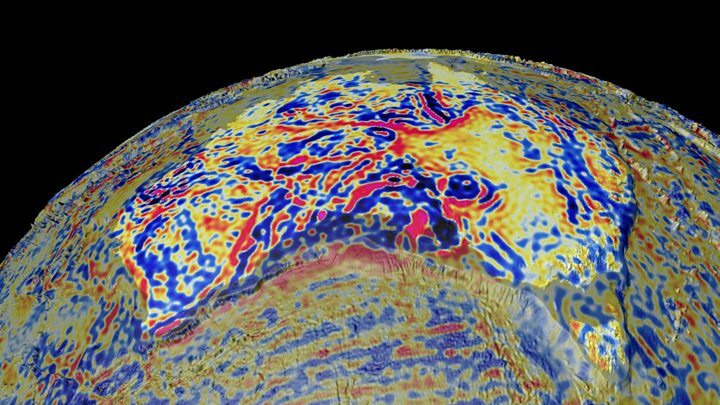 One of these bigger signatures is the magnetism retained in the planet's surface rocks. 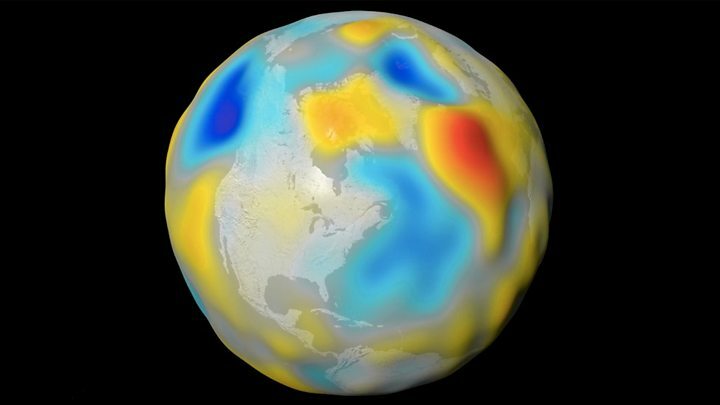 And Swarm's most detailed map yet of this aspect was also released at the EGU meeting. It incorporates four years of Swarm measurements, data from a previous German spacecraft called Champ, and information gathered by aeroplanes and ships. Regional features as small as 50km across can be discerned. Easy to spot are the famous "zebra stripes" at mid-ocean ridges where upwelling magma creates new seafloor and locks the prevailing magnetic field into cooling rock minerals. The discovery of the stripes in the 1960s was a major proof in the theory of plate tectonics. 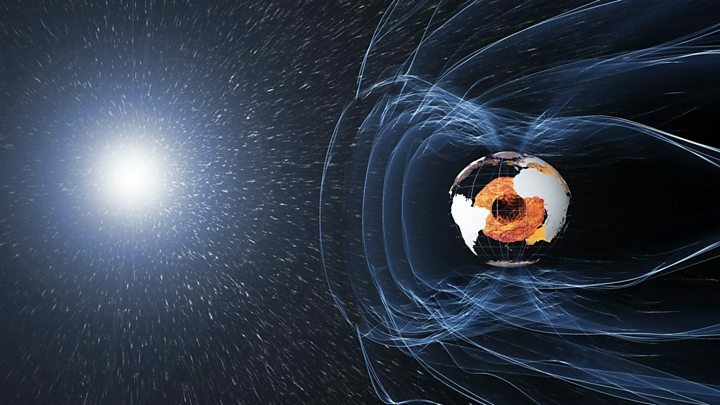 "Magnetic fields are one of the keys to understand the sub-surface of the planet, in combination with other pieces of information such as gravity and seismic measurements," said Rune Floberghagen, Esa's Swarm mission manager. "In the end this will allow us to determine the best ever model of the upper layers of the planet. This is the very clear, sworn ambition of the Swarm mission." The EGU General Assembly has been treated to a bounty of Swarm results to fascinate the specialists. But there is one observation that will certainly have more general interest - that of the position of the north magnetic pole. Most people know that it is not aligned with the geographic north pole and instead drifts around. Recent decades have seen it shift in a direction that is taking it away from Canada towards Russia. Swarm is watching this movement closely. "This year we are in a rather special situation because in 2018 the magnetic pole will be at its closest to the geographic pole. There is a separation of only 390km. The magnetic pole moves at a speed of about 55km per year," said Prof Olsen. The expectation is that the gap between the two versions of the pole will widen again from next year.